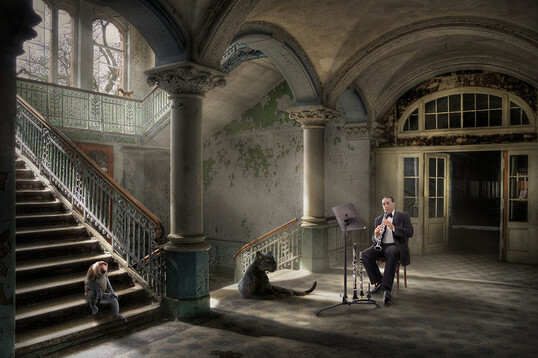 To mark the end of the year, here are a few of the most interesting images I've come across on the Web as the year closed. No copyright infringements are intended. Farewell to a strange year. Whatever tragedies, struggles and rewards it brought, it became a year en route to something larger. They say the journey is more important than the final goal, and perhaps we will look back on 2011 and miss it for precisely that reason. It was a year with some answers, but not all of them, a year when we still did not know what would happen; we were like people clustered in the cafés of 1910. It was a year of hanging threads, cliffhangers, a year that needed a sequel. In retrospect, maybe we will remember that it carried promise and hope, a potential for something beautiful and amazing that will change everything. The year began with catastrophe, was filled with upheavals, violent endings and still, the unseen promise of things - whether they will be good, or bad, or terrible - to come. It was a year of suspended animation, as we waited for the recession to end and more of the world's sleeping secrets to awake. Now, this year's dance is done. Possibly in anticipation of trials to come, some of us did not make it (see here; here; here; here; here; and here). Whatever it will bring, tomorrow is a new dawn, one step deeper into the second Millennial decade. But until that countdown to January 1, Fin. Image Source: Columbia Pictures via Popular Mechanics. Fukuyama would undoubtedly respond that ... [w]hat transhumanists seek is very different. They want to go beyond current innate human capacities. They want to change human bodies and brains. ... Can one be so transformed by technology as to be no longer human? Fukuyama predicts that genetically altered transhumans would regard themselves as superiors to normal humans, in a Gattaca-type world where the latter's civil rights would be removed. Bailey, meanwhile, criticizes Fukuyama's fears as a barrier to improvement and progress. In fact, the end results of transhumanism might be much more ambiguous than either Fukuyama or Bailey expect. 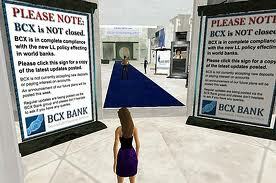 Second Life's virtual banking crisis (2008). Image Source: Second Life via Digital Alchemy. We are making a transition from the New Economy to a newer kind of economy. The origins of that newer type of economy lie in the Knowledge Economy. The names for the rising system vary: the Digital Economy, the Information Economy, the Global Economy, the Internet Economy, the Network Economy, the Virtual Economy, the Learning Economy, and one of my favourites: the Cognitive-Cultural Economy. I would argue that these new economies are all types of a 'Chronal Economy.' Digital, knowledge-based and virtual economies depend on a changing experience with time brought about by our interaction with technology. Perhaps the growing relationship between the virtual and the real, understood via new ways we experience time, will reveal what is happening to the global economy. It is that transformed relationship with time, so poorly understood now, that lies at the heart of constant financial concerns. Google streetview of Time Landscape (2011). Image Source: Google via Cryptoforestry. In the run-up to the holidays, I was reading a back issue of the now-defunct and sadly-missed Gourmet magazine. 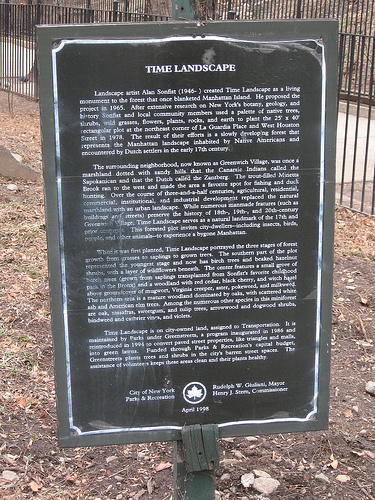 The December 1990 issue covered the Time Landscape, an art installation built in Greenwich Village, NYC, in the 1970s by Baby Boomer artist, Alan Sonfist. Time Landscape (1978) was conceived as one of the first environmental art pieces. 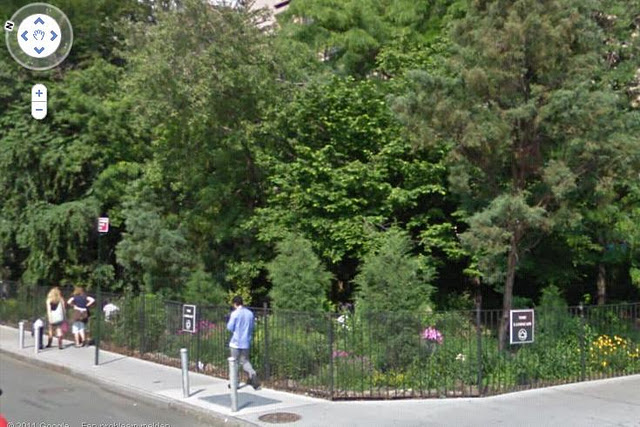 It constituted an effort to recapture a lost, pre-colonial landscape at the corner of West Houston Street and LaGuardia Place. Sonfist hired historians, botanists and various scientific researchers to replant indigenous plant species, including trees and wildflowers like violets and Black-Eyed Susans, on a small area of land in Manhattan. This effort saw, he claimed, the return of bird species to the area, such as hummingbirds, not seen there since the days of New Amsterdam. The economic quote of the week goes to Banksy, who left a new artwork on Canary Wharf almost a week ago. Report at HuffPo. Image Source: Ghost Hunting Theories. SUPERCONDUCTING SUPER COLLIDER Located about 30 miles south of Dallas, Texas, the Superconducting Super Collider (SSC) is a scientific complex that was once a profoundly expensive dream of the U.S. Department of Energy in the late 1980's to house the world's largest and highest energy particle accelerator and its supporting facilities. Plans for the SSC included a proposed 54 miles of underground tunnels that would extend and eventually encircle the town of Waxahachie, Texas and also comprise approximately 213,000 square feet in supporting facilities, buildings and infrastructure improvements. Its approximate 135 acre site located west of Waxahachie was to be totally self-sufficient and self-sustaining. Construction of the multi-billion project began in 1991, but was subsequently halted in October 1993 due to spiraling estimated costs to complete (more than doubling to over $8 billion) and U.S. budget concerns. 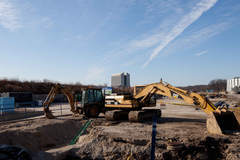 At the time of the project's cancellation, approximately $800 million had been spent to improve the site, complete the supporting facilities, and finish approximately 14 miles of the proposed tunnels. SSC is now for sale on an "as-is, where-is" basis. Hunt Ventures, advisor for the ownership entity, will be responsive to all credible offers. Offers without any or only minimal contingencies will receive strong consideration. Wired reported on this facility in 2009. In the 1980s, the Texas site was conceived to house the biggest particle accelerator in the world. Congress yanked the funding in 1993, ensuring that the world's biggest particle collider - and the future of scientific research in this field, with its vast potential for cheap energy sources as well as an array of commercial and defense applications - would end up in Europe at CERN. If there is one area of science that could change everything in our future, and is the basis of the whole Tech Revolution through which we are currently living, it is particle physics. There is a short history of particle accelerators, once called 'atom smashers,' here at Wiki. This is a classic example of politicians viewing scientific matters through ideological lenses, and mucking up long term projects that they don't understand. Wired has another related report here, entitled the 'Last Days of Big American Physics.' In February 2011, the American government denied funding to the Fermilab accelerator near Chicago, which, despite the existence of smaller US colliders that do different things, undermines US competitiveness in this field; Fermilab closed its Tevatron collider permanently in September 2011. As with NASA's ending the Space Shuttle program due to government cuts, there has been a serious crisis in American confidence with regard to the government's footing the huge bills for global-level scientific advances. But the alternative - Big Business going it alone - is not so great, either. The problem remains that private companies cannot fund this level of research by themselves because it is so expensive. And if private companies grow enough to be able to do so, we will face corporate conglomerates of the kind that were featured in Kim Stanley Robinson's Mars trilogy: business entities that are as powerful, or much, much more powerful, than nation-states or even groups of nation-states. It's worth contemplating that this alternative of unfettered corporations would likely spell the end of modern civic freedoms and governmental democracy in technologically advanced societies; as anyone who has read an employer's regulations manual knows, the internal legal principles that determine corporate governance and day-to-day management have few pretensions about being democratic. Then there is the state-industrial mix. Is the current model of government-industrial cooperation, which ensures these endeavours, all that great? Not really. There is a sticky, predictably nasty politicized debate around Big Government and Big Science, with typical discussions here and here. The more science and tech advances we see in this century, the more the power, money and authority required to drive them will likely reflect a hybrid public-private model for Public Administration and Management. In time, that new model will potentially provide a whole new legal foundation of government. This is why it is worth keeping an eye on changing currents in Public Admin theory, you know, just in case we end up electing armies of public-corporate management consultants, government contractors and business administrators instead of actual representatives and legislators. The book excerpt below concerns one of these burgeoning Millennial grey areas. It is taken from S. P. Osbourne, The New Public Governance? : Emerging Perspectives on the Theory and Practice of Public Governance (Routledge 2010). This excerpt concerns a template of public-private hybridization over big research and investment projects; that template involves public contracts with private companies in the US Military and in the famous example of the Challenger disaster. For now, as far as giant colliders are concerned, the US is playing catch-up. There are reports from late December 2011 that a new particle accelerator is being built in Batavia, Illinois, with US government funding (see here, here and here). It is due to be completed in 2013 or 2014. Construction of new accelerator, Illinois, 16 December 2011. Image Source: Jeff Cagle/Sun-Times Media via Napierville Sun-Times. As for the Texas facility, there are reports that its collider tunnels have been filled with water. See more images of the Texas accelerator facility from Wired below the jump (all photos below are by Jim Merithew/Wired.com). There are pictures of the site when it still had its equipment, here. 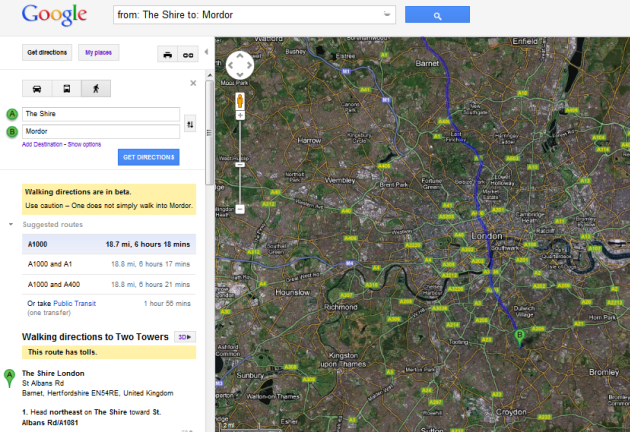 Many thanks to Tony Morrill for tweeting the Google Maps walking directions from the Shire to Mordor and the Two Towers (complete with auto-warning). This was an internet gag that was circulating about a week ago. 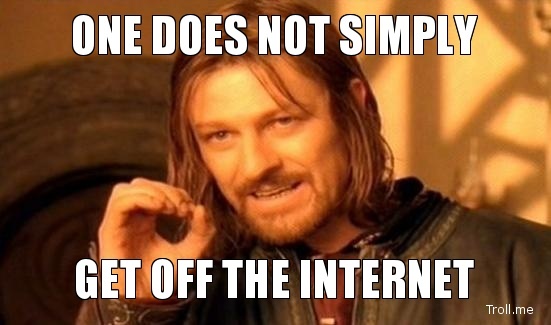 Sean Bean's line has also become a LOLcat type meme. Image Source: Troll Meme Generator. Also available as an avatar! 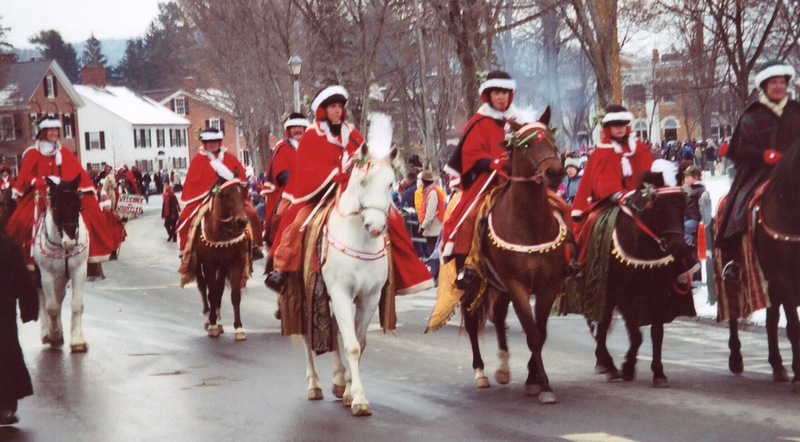 Woodstock, Vermont Christmas Parade. 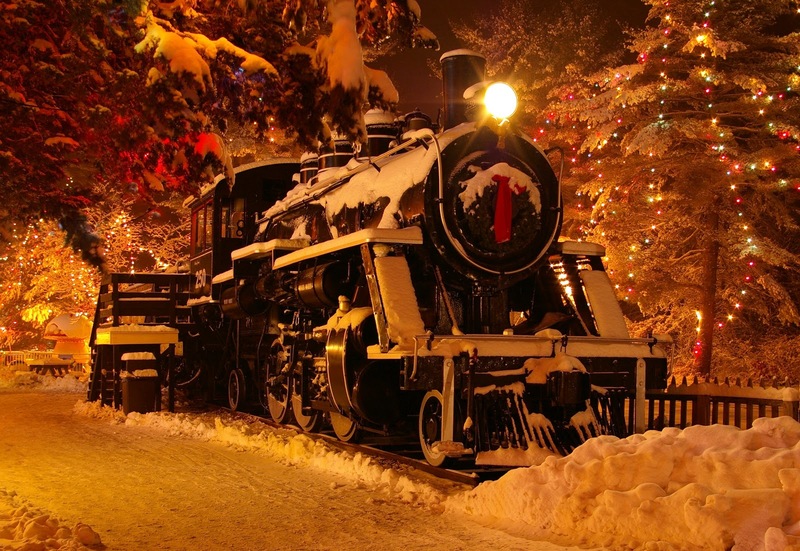 Image Source: Discover New England. Happy Christmas! For the day, here are a couple of New England Christmassy photos. Below the jump, a light post with twelve 'top ten' videos - one for each of the twelve days of Christmas - and each one relevant to the blog's themes. The Polar Express train at Edaville, Massachusetts. Image Source: Discover New England.